Hibiscus syriacus or Rose-Of-Sharon is a deciduous shrub or small tree native to Eastern Asia. 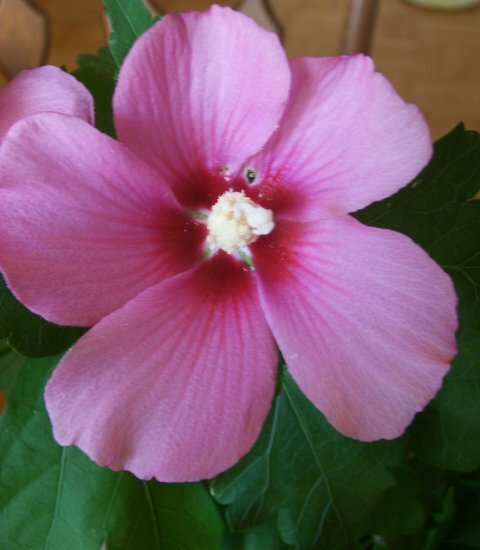 It is one of the cold hardiest of the Hibiscus family, going by many common names such as Rose-Of-Sharon, Althea or Shrub Althea and may be sold in nurseries as Althea syriacus. Whatever it is called, it is a great shrub or small tree to give your landscape a tropical look without moving to the tropics. Plants reach 10-12 feet (3-3.65 m) tall. Leaves are small, being only 3 inches (7.6 cm) long. The leaves are triangular to rhombic ovate, mostly deeply 3-lobed and coarsely toothed. They are very hardy in the landscape in USDA zones 5-9. Blooming: Hibiscus syriacus has a long blooming period. Here in Oklahoma, they bloom from July through September. Flowers come in many colors from white with a crimson centers to blue to bluish lavender with crimson centers. They can be either single or double flowers. The flowers only last one day and are 3 inches across. They are very showy. Culture: Hibiscus syriacus need full sun to partial shade. The plants are not fussy about soil type. In my yard, we amended the soil with peat moss and sand with gypsum added to help break up the heavy red clay that we have here in central Oklahoma. Plants are semi-drought tolerant here. With long periods of drought that we have, it is best to give some supplemental water through the summer months. We fertilize monthly with a 10-20-10 fertilizer and try to do this before it rains. If no rain is in the forecast, then we have to water the fertilizer in. This is one of my favorite shrubs for Oklahoma and with its showy flowers and long blooming season it is a great plant for the landscape. Propagation: Hibiscus syriacus is propagated by cuttings and from seed. Hibiscus syriacus was featured as Plant of the Week July 10-16, 2009.